Orson Welles's Macbeth will be shown as part of Chico State's University Film Series on Tuesday, April 17, at 7:30 p.m. in Ayres 106. Using ideas developed for earlier stage productions, Orson Welles shot this film on the Republic Studios' back lot in twenty-three days, creating a kind of Dark-Ages surrealism to present Macbeth as a clash between Christianity and Celtic paganism. The studio later forced Welles to cut the film by twenty minutes and to have his actors redub their parts without Scottish accents. The Film Series will show Welles's original version, uncut, with the burrs intact. I went to this event at Chico and was really good and easy to not getting bored unlike other Macbeth. Since it was a lot faster than the Polanski version it was easy to follow but doesn't give you the full version of Macbeth and cuts of some stuff. However, i did like Orson Welles still better than Polanski. I have to agree with Jesus. I did feel the other Macbeth was a little dragged out. I enjoyed this version better because it had more of a mythical feel than the one we watched in class. It makes a difference to have the actors tape and later act out the scenes. This made the film even more interesting before watching. It felt like the actors were focused on the emotion they should be bringing to the scene. I believe it made the fill different and more interesting. I agree with both blogs about how interesting it was that the actors taped and than acted out the scenes, making them appear move engaged and in tune with the scenes. However this movie was hard for me to follow and understand where the plot was going. I've gotta say that I enjoyed viewing multiple versions of Macbeth, and despite the differences between them I appreciate Welles approach to this rendition. The variation between this portrayal and Polanski's are quite stark especially in terms of the treatment of gore, and the power the witches have on Macbeth. Aside from the acting differences, both versions stand on their own as powerful pieces. Given Welles' budget, time constraints, and year of creation this is a notable Shakespearean portrayal. 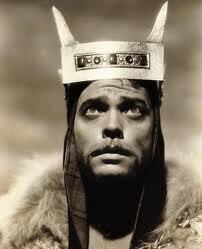 I liked both this version of Macbeth and the showing we saw in class. This film was shorter but less theatrical to me and therefore less entertaining. Polanksi brought the story to life more for me than Welles' was able to.